Revive delicate skin around the eyes with Eve Rebirth Bio-Intelligent Eye Contour Cream, an anti-ageing eye cream that works to combat signs of ageing and fatigue, such as fine lines, dark circles and puffiness. Utilising Biointelligent Microingredients, the cream performs deep anti-wrinkle action and delivers anti-ageing actives to target areas. Its dose of dehydrated and cross-linked Hyaluronic Acid microspheres 'fill' and plump the appearance of wrinkles for smoother-looking, hydrated skin, and its re-contouring properties ensure skin around the eyes feels firmer and volumised. Helping to both prevent and combat under eye bags, the cream reduces inflammation and promotes fluid drainage to lend eyes a brighter, more youthful look. 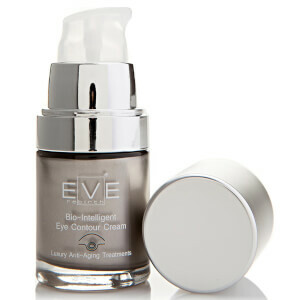 Signs of ageing and fatigue are diminished, and fatty acids improve the skin's barrier function. Apply a small quantity of product every morning and evening on well cleansed face. Massage with round movements until completely absorbed.